Typhoon FGR4s over China Lake. No.17 test and evaluation Squadron Typhoons in an air defense fit and air to ground PGM fit. with 20 canvas prints (giclées). Artist's proofs have an original pencil drawing of a squadron badge added to the print border. Please specify squadron when ordering. 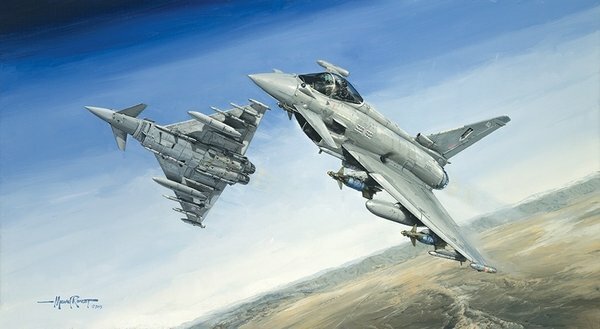 Remarque copies have a detailed drawing of a Typhoon with a squadron badge added to the print border. Please specify when ordering. Canvas prints replicate the look and feel of the original oil paining. The image size is 30x20 inches.